We have a new first-time winner this week! 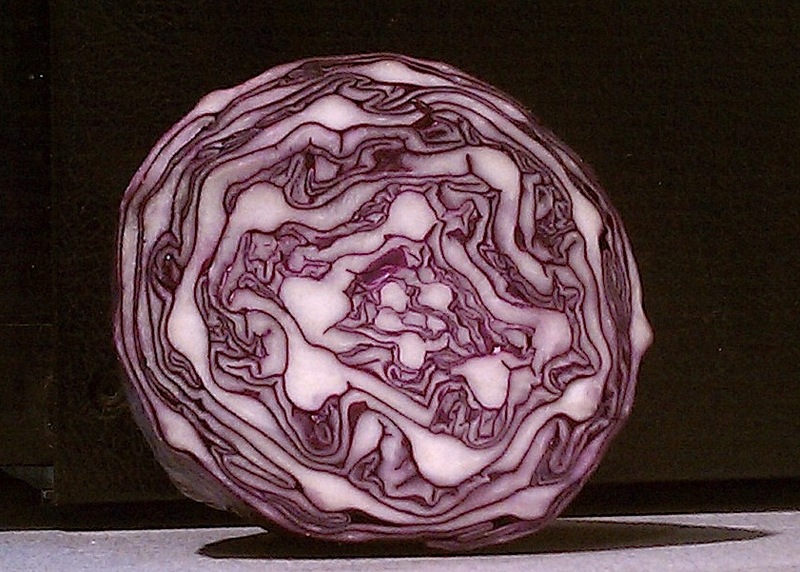 Jana and Vicki receive 25 points for correctly guessing red cabbage. Michelle receives 25 points for correctly guessing red cabbage + 5 extra points for specifying “the side of cut red cabbage”. Pertusey gets 15 points for his correct guess over at cafewitteveen, but misses out on the extra +10 for not answering in the comments. Welcome to the CUP contest, Pertusey! Jeremy, Jude and Lynn (Facebook) get 15 points each for participation, but ultimately incorrect answers. Jude receives an additional 5 points for causing me to snort coffee out of my nose with his guess “shar-pei?” Welcome to the game, Jude! Thanks for playing, everyone! Stop by the CUP Winners page for the current rankings, as well as past contests and winners and a description of the lame prize that I have chosen for the first player to reach 1000 points! The previous comment was brought to you by your mom who is still logged in evidently.